Are you Sloshing your Muscles into Shape? Have you ever gotten sloshed? I mean really sloshed? If not, you need to introduce yourself to the pipe. The slosh pipe! The slosh pipe is a fun addition to any muscle building program and is sooo simple to make. The design: A fat PVC pipe, from 2” to 4” in diameter, 10’ (that’s feet, or about 3 meters) long, filled with water or water and pebbles. Because the weight has the potential to move on you at any second, your body begins to compensate, slowly at first and then with greater and greater effort. 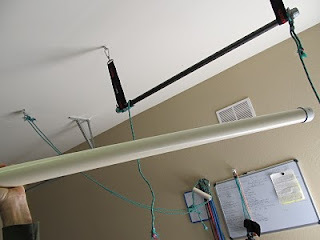 Gym Jones has featured the overhead slosh pipe hold in their tag team workouts and it is a great way to challenge muscle endurance and mental endurance. You will struggle and it will eventually break you. Muwahahahaha! 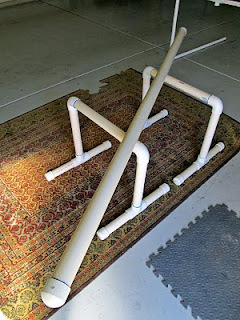 Start with a 2, 3, or 4 inch diameter, 10’ long PVC pipe. Buy two slip-on end caps to fit and a some pvc glue to make sure they stay on and don’t leak. Glue and cap one side and fill it about ¾ of the way with water. For a little extra weight you can add pebbles or sand, but in the larger pipes it may not be necessary. A 2 inch weighs 20-25 pounds, a 3 inch about 28, and a 4 inch about 40+ pounds.Yes, you can afford it. Go. Go get it now. Any exercise can be performed with the slosher, but to illustrate how effective it can be, let’s assume you are using a 2” diameter pipe. Pick it up to do a one arm overhead press, and the first thing you notice is that it takes every muscle in your body to keep it balanced and get it up to the shoulder. Actually you might notice how it falls off to one side as you attempt to get it to your shoulder. Now press it and try to hold the top position for five seconds. As the water inside shifts, so do the muscles in the body. They are constantly adjusting to compensate for the unbalanced load. Now lower it, trying to keep the pipe horizontal. Go slow! The faster you move, the harder it becomes. The more momentum the water inside builds up, the more extreme the stress of the variable load on the body. 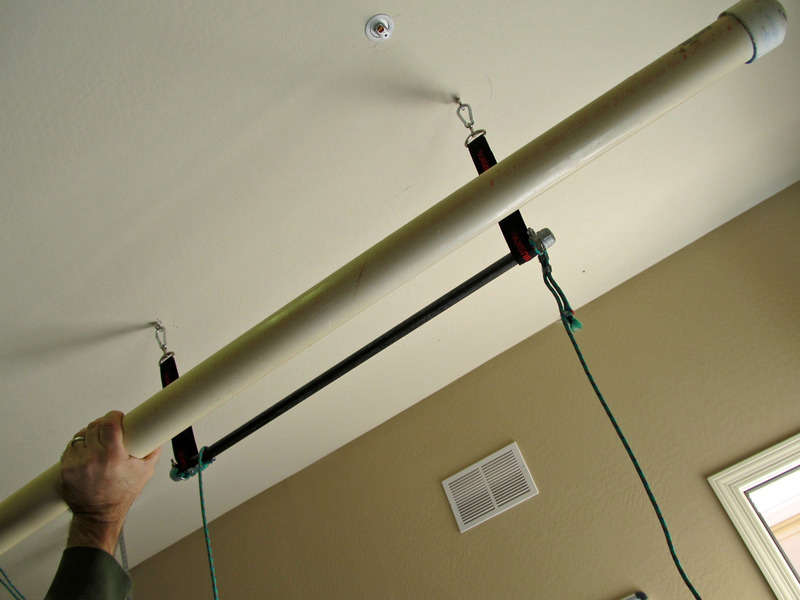 At around 10-15 dollars, the slosh pipe is a dirt cheap addition to your home gym equipment. Try starting out with a 2 inch pipe and performing one arm cleans, overhead presses or bent presses with it to start out. One arm curls and Turkish get-ups are also nice and challenging. In addition to being a great tool for increasing muscular endurance, the slosh pipe is also a great core workout. Go get yours today and have fun! Author adminPosted on January 25, 2011 Categories UncategorizedLeave a comment on Are you Sloshing your Muscles into Shape? One of the best pieces of equipment for home workout routines you can have.is not found at the local sporting goods store, not in the fitness section of a local superstore and not online at Amazon.com. You will be able to pick up everything you need to put these together at your nearest home improvement store, however, and all for about $40 dollars. I am talking about homemade clubbells, or indian clubs. If you’ve seen my post and video Home Workout Routines with a Homemade Clubbell you are familiar with how I created a monster cross between a macebell and an indian club. This time we are covering making two identical and lighter clubs, with a smaller diameter grip. Having two clubbells provides a different challenge; sure the lighter weight is better for endurance and prehab/rehab work, but the new dynamic challenges coordination and timing as well. The smaller, lighter clubs allow you to perform an entirely new chapter of exercises as well, or at least to perform them differently. 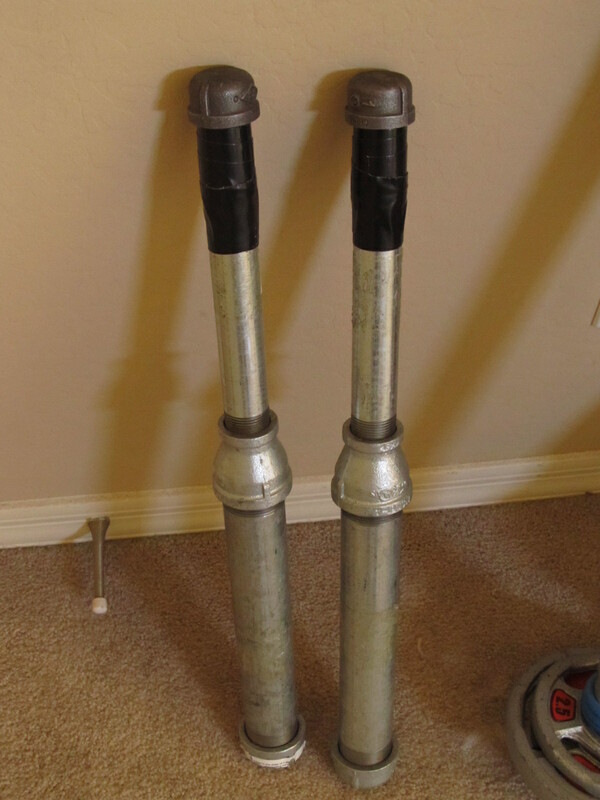 2x 1″x10″ galvanized steel pipes. 2x 1 1/2″ x 12″ galvanized steel pipes. 2x 1 1/2″ steel caps. 1 bag of small river rock, pea gravel or similar. This is for filler and must be small enough to reach to the bottom of the 1″ pipes. Each one weighs about 6 pounds and challenges the grip. Speaking of grip, I chose black Gorilla tape for mine, it feels better than duct tape to me. Of course,if you can find something heavier than rocks (lead shot? ball bearings?) the clubs might weigh more. Another alternative is to buy larger pipes to connect to the 1″ ‘handle’ if you can find them. Online hardware stores are handy for finding these parts. Once you have your new homemade indian clubs, it’s time to figure out what to do with them. Follow this series of youtube videos produced by RMax International, starting with this one and start practicing! A homemade clubbell is an awesome and fun piece of equipment to have around your gym. They don’t take up much space and are effective an engaging multiple core muscles with every movement. With clubbells, derived from traditional Indian clubs (http://hubpages.com/hub/Indian-Clubs-and-Clubbells) a little weight presents a whopping challenge. It is generally recommended that men start with one or two 15 pound clubs and women 10 pounds or less, but it all depends on the individual. When I first started trying to swing a club around, 10 pounds was difficult enough. Before I introduce the workout, check out these two videos on making homemade clubbells. Once you have bought or built your club, here’s a great whole body workout to try with it. With heavier weights it may be necessary to use two hands, and make sure to start out light until the movement becomes fluid. Do the following as a circuit and start with 10 reps each in a continuous cycle, adjusting for your fitness level and the weight of the clubbell. The Clubbell Mill: A great exercise for hip strength and power through the rotation of the torso.